If you’re overweight and looking to get flat abs, it’s going to be a must that you’re paying attention to the exercises that you’re including in your workout program. However, abdominal exercise selection alone is not enough. The biggest must-do if you want to achieve flat abs is to focus on cardiovascular exercise and eating a calorie reduced diet. If you aren’t eating a lower calorie diet, fat loss will be virtually impossible and this will mean your abdominal appearance will stay as-is even if you perform abdominal exercises daily. In combination with diet, cardio is also a necessity if you’re trying to burn fat from your waist. Once you’ve got your diet in order, here are five great abdominal exercises that you should consider including in your workout routine. These are what I consider to be five of the most effective abdominal exercises for women. Not an end all list, but a great place to start. Lying leg raises are the first exercise to be performing. This exercise is perfect for working the lower abdominal muscles and for firming the tummy quickly. When doing lying leg raises, you’ll want to ensure that you keep the back pressed flat into the floor at all times, never letting it lift upwards as your legs rise up to the 90 degree point. Also be sure that your legs never drop down to the ground either, as that’ll take all the stress off the lower ab muscles altogether. The bicycle is the next exercise to add to firm the abs. 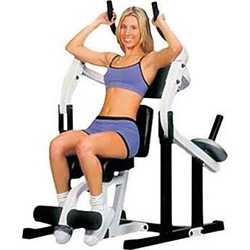 This one is great for strengthening the oblique muscles, so will help you reduce the appearance of love handles that so many people despise so much. The bicycle is also good for strengthening the entire abdominal section as the legs will stay elevated off the floor the entire time. Perform it in a slow and controlled manner for best results. Decline sit-ups are the next exercise that you should be doing in your workout program. These are great because they’re going to place far more strain on the abdominal muscles as you move along the decline and against additional resistance. If you want to intensify this exercise, add a twist to the movement so that you call the obliques into play as well. This movement can cause the hip flexors to tense up, so just make sure that you do perform some stretching exercises after it’s completed. The fourth exercise that’s a must to firm up your core is the plank exercise. The plank is going to help build muscular endurance very well and is an isometric movement, unlike all the rest. This exercise can be done incorporating a leg raise into the picture or done with the hands or feet up on an exercise ball as well. Make sure that at no point do you allow the hips to rise up or fall back down as you perform it as this would instantly take the stress off the core muscles and put you at risk for additional pain. Finally, the last exercise that you should be performing in your workout program is the prone ball roll-in. Prone ball roll-ins are going to be great for firming up not only the core, but the shoulders as well. As you do this exercise, make sure that you focus on tensing up the abdominal muscles to bring the ball into your core rather than performing it with the hip flexor muscles instead. So there you have it, five great core/abdominal exercises that are must-haves in your workout routine. Choose two or three of these to perform each workout and you’ll be happy with the results. Also, be sure to check out this women’s core workout if you’re looking for more great exercises. Just remember though, exercise alone is not enough to get a defined six pack. Don’t forget that these exercises will need to be utilized in conjunction with a balanced, healthy diet. You’ll also want to make sure you mix in cardiovascular exercise if you’re looking to achieve optimal results, especially if you currently have a high body fat percentage. These 3 (weight training, cardiovascular exercise, and nutrition) components coupled together will have you seeing results in no time. So what are your favorite ab exercises? Let us know in the comments below!